The Wi-Fi Alliance today officially launched WPA3—the next-generation Wi-Fi security standard that promises to eliminate all the known security vulnerabilities and wireless attacks that are up today including the dangerous KRACK attacks. However, in late last year, security researchers uncovered a severe flaw in the current WPA2 protocol, dubbed KRACK (Key Reinstallation Attack), that made it possible for attackers to intercept, decrypt and even manipulate WiFi network traffic. 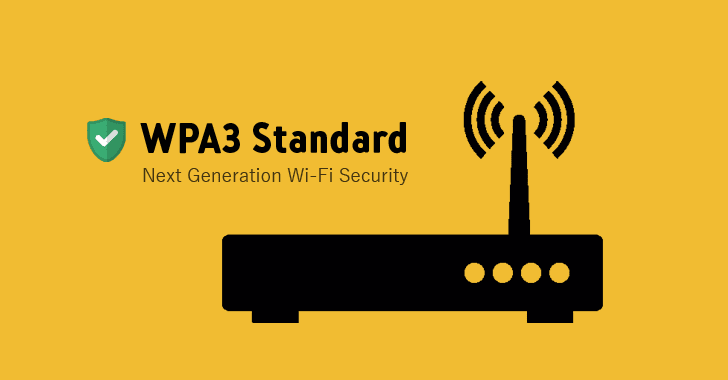 Although most device manufacturers patched their devices against KRACK attacks, the WiFi Alliance, without much delay, rushed to finalize and launch WPA3 in order to address WPA2's technical shortcomings from the ground. What is WPA3? What New Security Features WPA3 Offers? The new security protocol provides some big improvements for Wi-Fi enabled devices in terms of configuration, authentication, and encryption enhancements, making it harder for hackers to hack your Wi-Fi or eavesdrop on your network. On Monday, the Wi-Fi Alliance launched two flavors of latest security protocol—WPA3-Personal and WPA3-Enterprise—for personal, enterprise, and IoT wireless networks. WPA3 provides enhanced protection against offline brute-force dictionary attacks, making it harder for hackers to crack your WiFi password—even if you choose less complex passwords—by using commonly used passwords over and over again. WPA3 leverages SAE (Simultaneous Authentication of Equals) handshake to offer forward secrecy, a security feature that prevents attackers from decrypting old captured traffic even if they ever learn the password of a network. WPA3 strengthens user privacy in open networks through individualized data encryption, a feature that encrypts the wireless traffic between your device and the Wi-Fi access point to mitigate the risk of Man-in-the-Middle (MitM) attacks. To prevent such passive attacks, WPA3 could add support for Opportunistic Wireless Encryption (OWE). Using WPA3 Enterprise, critical Wi-Fi networks handling sensitive information (such as government, , and industrial organizations), can protect their Wi-Fi connections with 192-bit encryption. Alongside WPA3, the WiFi Alliance has also announced a new feature, called Wi-Fi Easy Connect, that simplifies the process of pairing smart home gadgets (without any screen or display) to your router. Wi-Fi Easy Connect is a replacement for Wi-Fi Protected Setup (WPS), which has been considered insecure. With the support for Easy Connect, you will be able to pair your smart gadget with the router by simply scanning a QR code with your smartphone to have the Wi-Fi credentials automatically sent to the new smart device. It should be noted that both WPA3 and Wi-Fi Easy Connect will not hit the mainstream right away. In fact, it is going to be a many-years-long process that will require new routers and smart gadgets to support WPA3. Therefore, WPA2 will not stop working any time soon, and devices with WPA3 support will still be able to connect with devices that use WPA2 for the working of your gadgets, but WPA3 support will eventually become mandatory as adoption grows. WPA3 is set to roll out later this year and is expected to hit mass adoption in late 2019, when it eventually become a requirement for devices to be considered Wi-Fi certified, according to the WiFi Alliance.